Floating work dock in the Surrounded by Sharks 385,000-gallon tank. With the April 30 opening date nearing quickly, construction is underway on Newport Aquarium’s Shark Bridge. Shark Bridge, Newport Aquarium’s newest attraction, is a nearly 100-foot-long suspension rope bridge where you can walk inches above the aquarium’s 385,000-gallon tank filled with seven species of sharks, four rare and exotic shark rays, multiple stingrays, and more than 300 fish! Will you dare to cross? 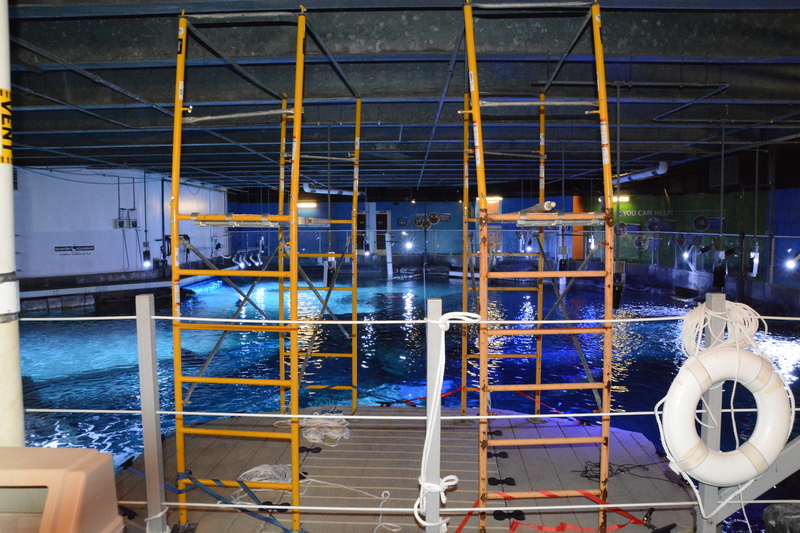 Stonhard, a New Jersey-based company that specializes in manufacturing and installing seamless floors, began the early stages of Shark Bridge construction by installing a new industrial floor system that surrounds the shark tank on March 25-26. 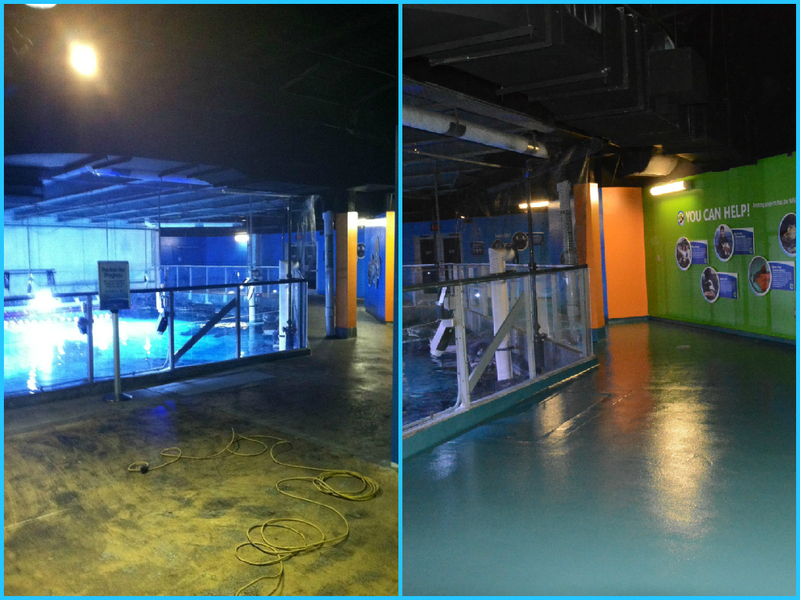 Before and after photos of the new flooring that surround the shark tank. Stonhard Territory Manager T.J. Mangan and his Michigan-based installation crew covered the 1,400-square foot area around the shark tank with a teal-colored, three-part mix that is resistant to salt water. According to Mangan, Stonhard has installed flooring at various aquariums throughout North America, including Mexico City Aquarium. The next step in Shark Bridge construction will be installing steelwork that will allow the roped bridge to suspend from the ceiling. The steelwork has already been fabricated offsite and is set for delivery by the end of March. Installation for the steelwork is schedule to begin April 3, with an April 17 expected completion date. 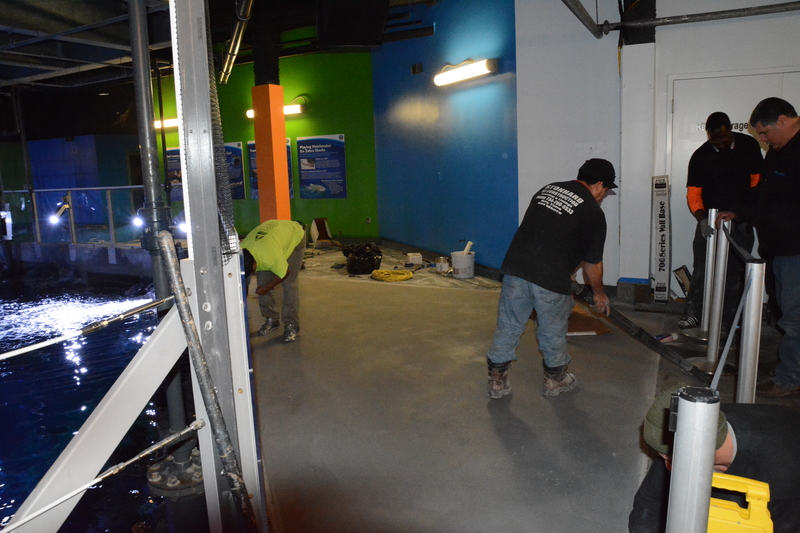 Stonhard members working on the installation of a salt-water-resistant flooring system that will surround Newport Aquarium’s 385,000-gallon shark tank. The floating dock that construction workers will stand on while installing Shark Bridge is already in the shark tank. You can see the dock while walking through the Surround by Sharks tunnel! Newport Aquarium’s blog aquariumworks.org will provide further updates on Shark Bridge construction as it becomes available. This entry was posted in Shark Bridge and tagged construction, flooring, newport aquarium, shark, Shark Bridge by NewportAquarium. Bookmark the permalink. We are season pass holders and super excited about this! Will it be an extra fee or included in the price?